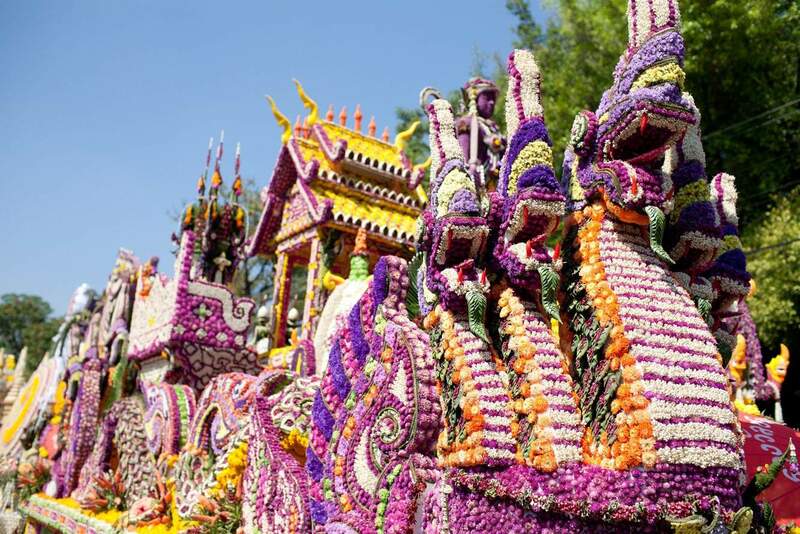 The Chiang Mai Flower Festival has been running for over 40 years and celebrates the beautiful flowers in bloom during this time. 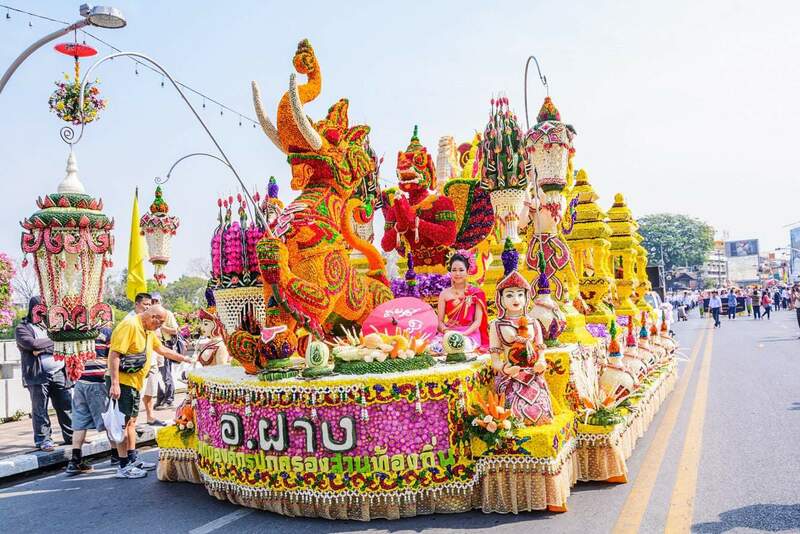 The festival runs over 3 days at the start of February each year and draws thousands of visitors to Chiang Mai. 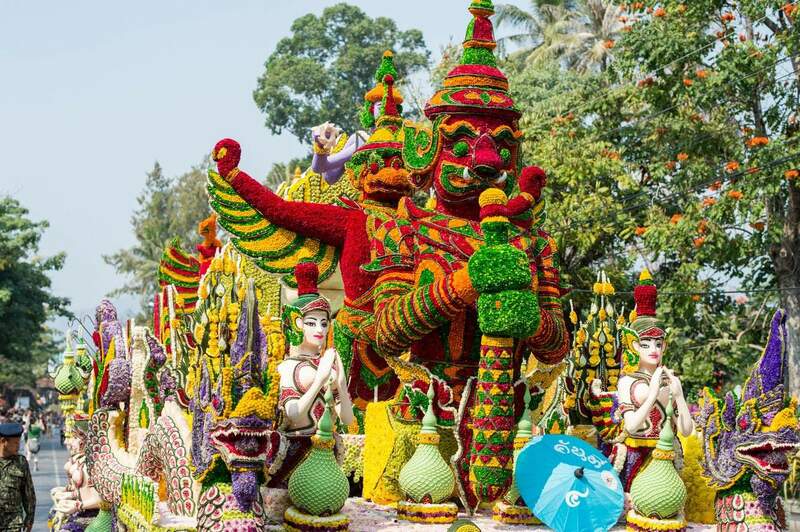 By bringing to light a vibrant display of ancient and modern floral art the festival also exemplifies the traditions of the ancient Lanna Kingdom. Economically, the festival also contributes to the city’s growth and development since it advances the horticultural sector and also the tourism sector. 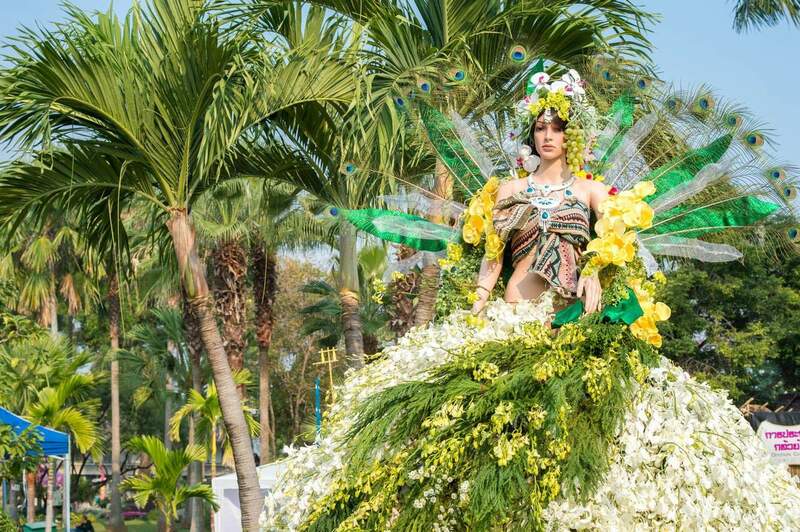 Typically, the first day of the festival involves an agricultural fair as well as the exhibition of floral arrangements and landscaping trends. 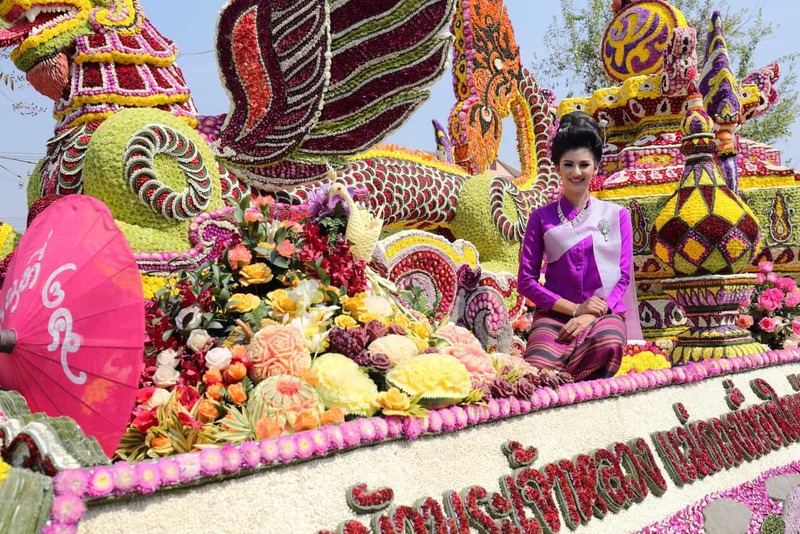 Subsequent days involve an elaborate display of splendid flower floats, a fair that showcases local works of art, music shows as well as the display of beautiful ornamental plants. 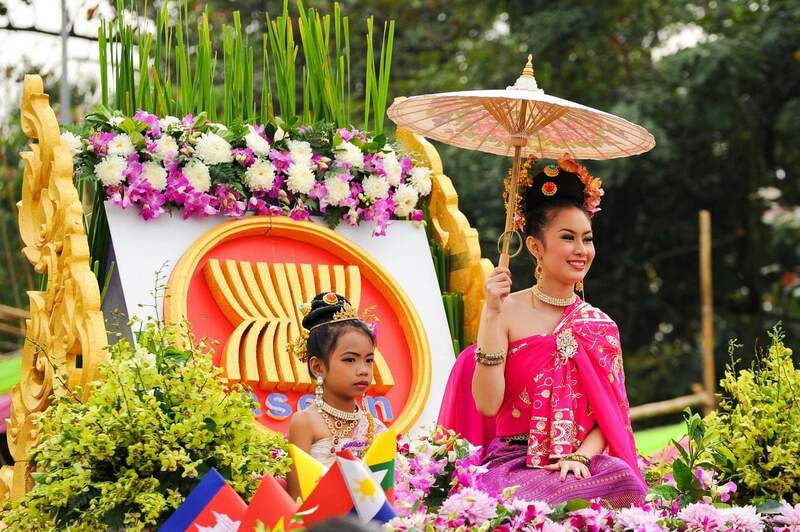 On the Saturday of the festival, there is a large parade that typically takes place from Nawarat bridge to Thapae road, Kotchasarn Road, Changlor Road and then to Arak Road (Nong Buak Haad Public Park). 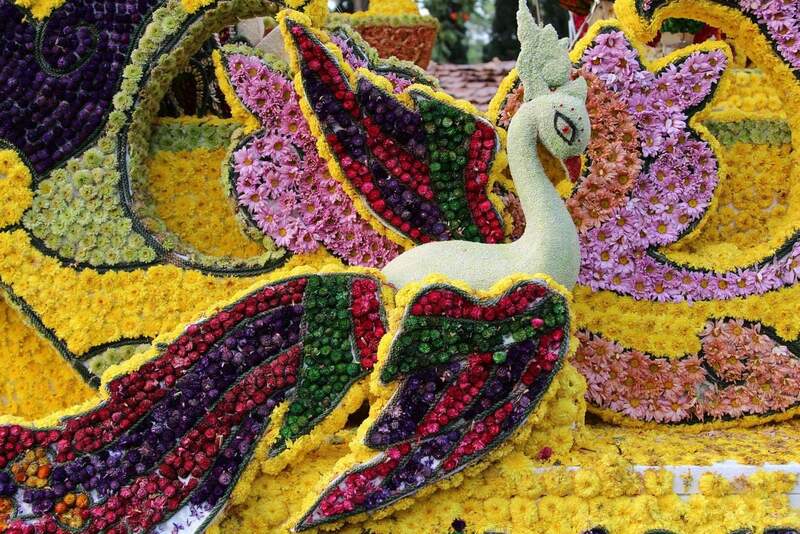 There will be large floats adorned with flowers as well as marching bands, school groups and dancers also taking part. The roads will close leading up to and during the parade, but there are generally police directing traffic away from the festival. 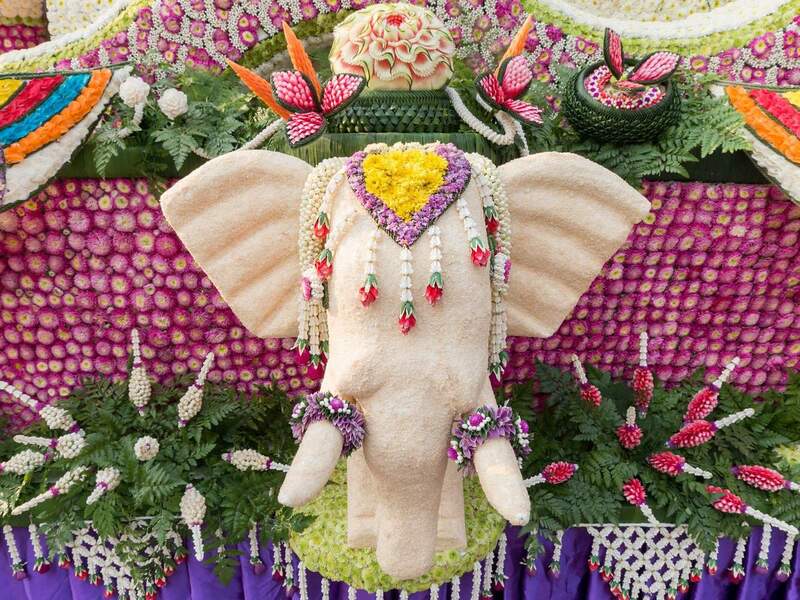 There are also competitions for the most beautiful and creative display as well as the best float. 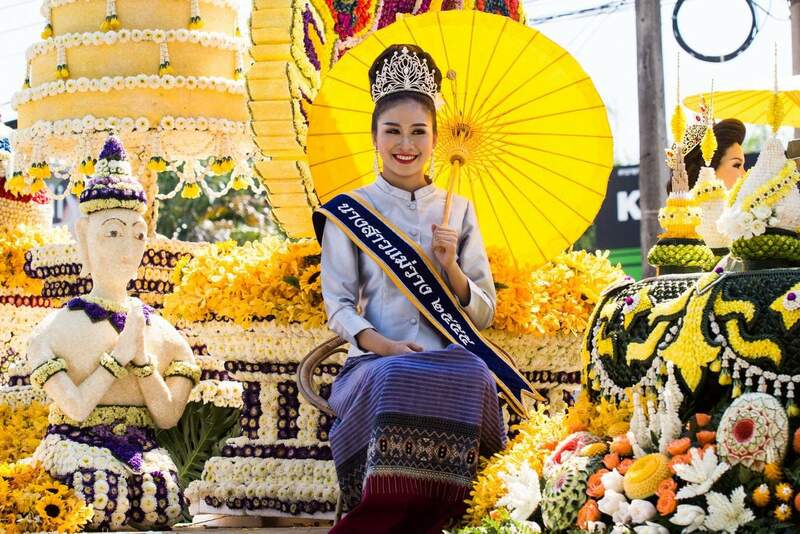 One of the most popular parts of the festival is choosing the Chiang Mai Flower Festival Queen. Deliberations go way into the night with celebrations for the winner. There will be plenty to eat and drink around the festival and the weather is typically warm during the day and delightfully cool in the evenings. 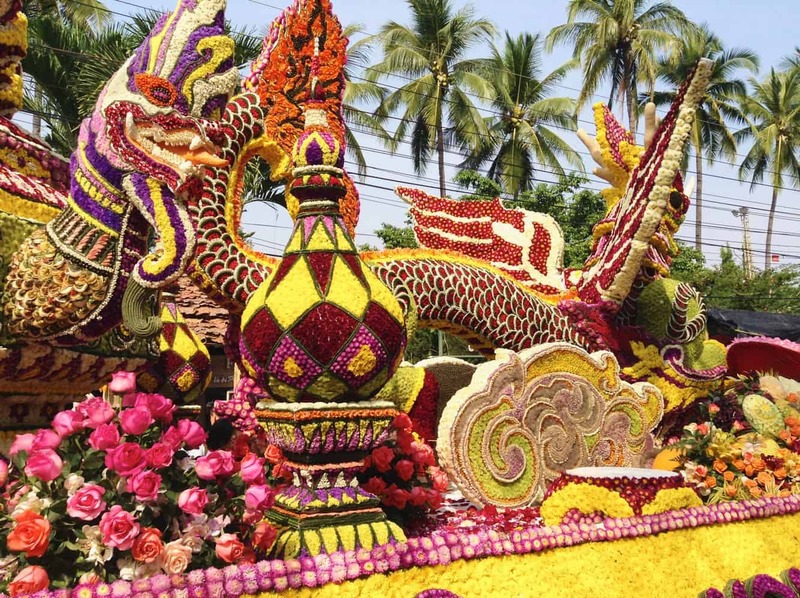 So come on over to the Chiang Mai Flower Festival and enjoy this wonderful cultural event! Will it be on the first weekend for February 2020? We would love to plan a trip next year! It doesn’t appear that a date has been confirmed for next year just yet. Some other sites report that the dates are February 7 – 9, 2020, but this is just an estimation based on the timing of previous years. I’ll add any new details when they become available. 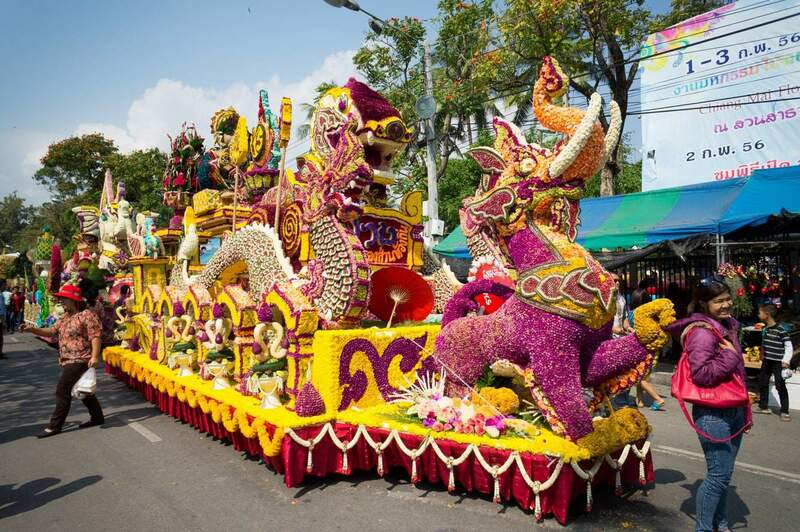 Would like suggestions for good hotel on or near flower festival parade rout? Looking at the route of the parade at the following link (//chiangmaibest-9559.kxcdn.com/wp-content/uploads/2014/03/Parade-route-for-Chiang-Mai-Flower-Festival-960×576.jpg), i would advise to stay near either near Tha Phae Gate or the South Gate of the old city. Now i don’t know what your budgets or requirements are, but there isn’t much accommodation along the parade route (aside from hotels and guest houses), as the majority of the buildings along the parade route are businesses. 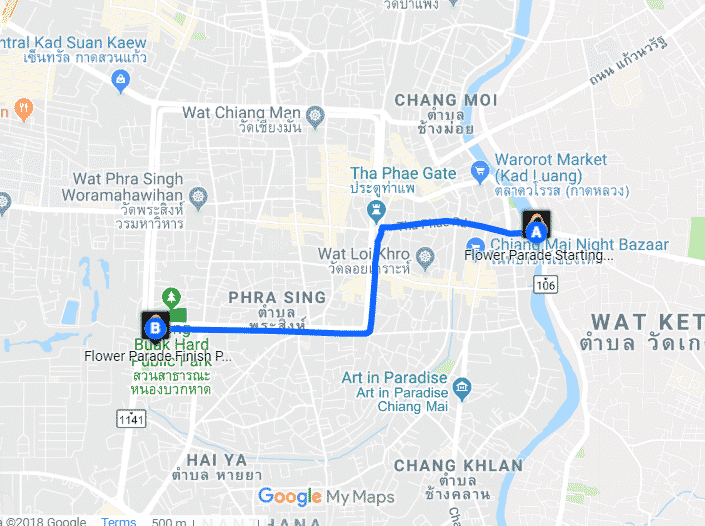 So most of the hotels / resorts will be within the old city or just outside the moat on the south side, or near Loi Kroh Rd / Tha Phae Rd. Why it’s almost impossible to know where are the places of dances and music, during flower festival? I am tourist, I appreciate that festival and every time the same problem of information; it’s pity !! Unlike western countries that you may be used to, Thailand isn’t accustomed to publishing schedules or programs for these type of events. It is best to travel to Thailand with an open mind and open schedule. I suggest that you ask at your hotel for recent updates and follow the crowds. What time does the parade begin? How early should we plan to be at the parade route? We want to watch Saturdays parade, you mention a lot of roads are closed. Where is a good place to park, so we could walk in? If you are driving a car, I would avoid driving into the Old City at all. If you are using a scooter, you can still get in nice and close as you can pretty much park anywhere in Chiang Mai, as long as you are not blocking a driveway. Alternatively, get an Uber from your hotel, as the driver will be able to drop you off and then collect you afterwards. Not sure which roads are closed, Chiang Mai isn’t that organised where they publish this information in advance. You just have to wing it on the day! 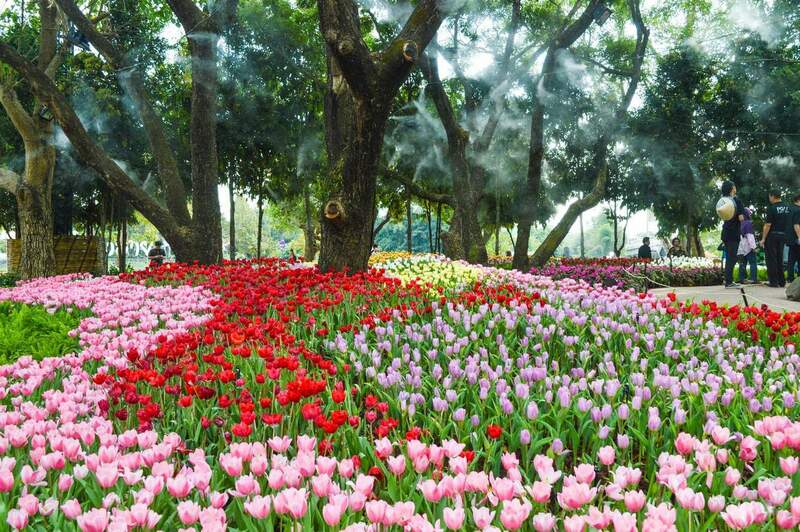 Have a wonderful time at the Chiang Mai Flower Festival. When is the best time to visit Chiang Mai and Chiang Rai? May through to September we can travel. We like to experience the true area not just the tourist places. September is a great time to visit Chiang Mai and Chiang Rai. The hot season starts to slow down in around June/July, so September will give you cool evenings whilst still being hot and sunny during the day.